Spicy, tangy and healthy munchies. Bitter melons are considered as healthy vegetable but just because of its bitterness many tend to avoid it. This way of baking and consuming them makes it healthy with a snack to enjoy with a unique taste. This can be served as a snack/appetizer. Bitter gourd is believed to improve the body’s ability to use blood sugar and glucose tolerance. It is helpful in fighting cancer and several infections. It’s high beta-carotene that helps alleviate eye problems and improve eyesight. The juice of the leaf has been found to be beneficial in the treatment of alcoholism. It is also said to build the immune system. Consuming 20 ml of the juice daily helps cleanse the liver. It is recommended for asthma patients. Wash and cut and discard both ends of the bitter gourd, then cut them into 1/4inch thickness round and set aside in colander with 1/4tsp salt for 2-3hours. Pre-heat the oven at 18odeg C, line the baking tray with baking sheet and grease with cooking spray and keep aside. In a bowl combine rice flour, corn flour, chilli powder,dry mango powder, garlic powder, oil and set aside. After the resting period of bitter gourd squeeze slightly the chopped and soaked gourds and this to the spice and flour mixture and toss until coated evenly. Once tossed arrange on the lined and greased baking tray and bake for 35-40minutes, flipping halfway so that both sides are cooked evenly. Let it cool on baking sheet for 10minutes before serving. Posted on September 14, 2014, in Breakfast, Indian, Starters. Bookmark the permalink. 32 Comments. Wow I’ve never heard of these. Where do you find them? Hi Sarah – They are usually available fresh in Indian grocery stores..They are available in frozen section in some supermarkets but fresh are preferred.. 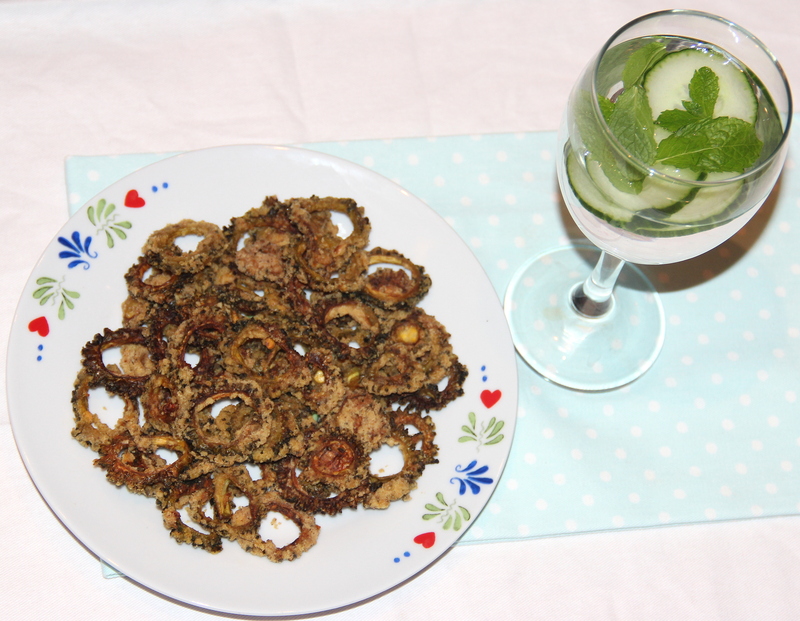 I like the karela vattals… Your baked version also sounds good! I love bitter gourd. . These bitter gourd chips look crispy and delicious!! Love the fact that that this is baked and not fried. . Yum!! Nathan – Glad you recollected good old days…. I think, this is one of the best ways to make Karela eatable 🙂 Superb! TC! Keep smiling 🙂 Happy cooking!